Hey lovelies, if you follow me on Instagram and Snapchat @feistyfox25 you must have already seen snippets of my absolutely fabulous Staycation at the Hyatt Regency,Mumbai. Given my super hectic schedules with endless blog shoots, event appearances, blog post deadlines and personal commitments, the concept of ‘ME’ time seemed completely alien to me for last couple of months. So when the Hyatt Regency, Mumbai extended an invitation to me and my husband to be a part of the The FAM to Hyatt Regency ‘Make the Most of Being Away’ from home campaign, I was so excited at the thought of breaking away from my daily routine and finally getting some quality downtime and some luxurious pampering, while not even having to leave the city. We stayed at the Hyatt Regency,Mumbai for 2N/3D, and thoroughly enjoyed the world-class Hyatt Regency hospitality,which is known to give its guests everything they need in one place – fantastic hotels/ resort experience across the world, caring staff, excellent food and much much more. 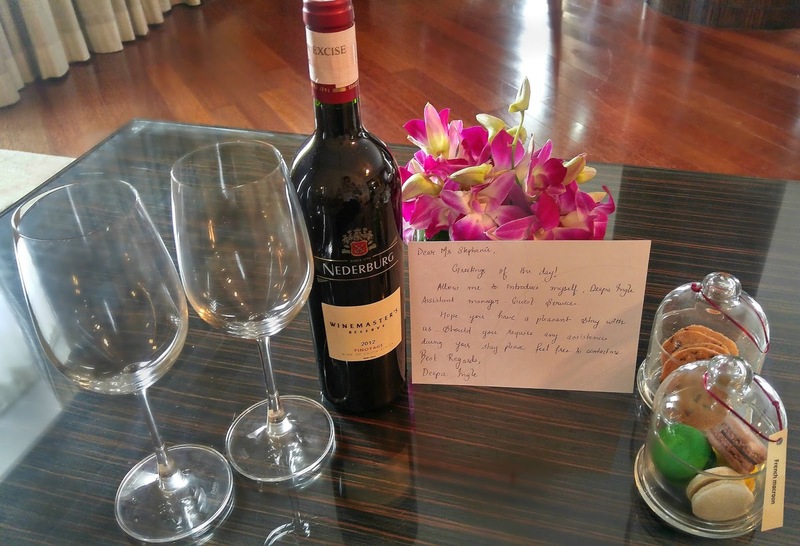 We were given such a lovely welcome with a personalized hand-written welcome card by the hotel manager, a bottle of wine and lots of sweet goodies. The focus of FAM to Hyatt Regency is their recently launched global campaign ‘Make the Most of Being Away’ tapping a popular requirement of breaking away from the daily routine, witnessed amongst guests. ‘Make the Most of Being Away’ is a representation of not only what Hyatt Regency has stood-by for more than 30 years in India, but also, what the brand has practiced globally throughout its nearly half-a-century of existence. “The joy of breaking away from daily routines has been a popular sentiment which we have witnessed amongst our guests. Hence, as much as they like to be home, we are urging our guests to ‘Make the Most of Being Away’ through this campaign. This new campaign lets travelers know that we not only understand, we agree. The Hyatt Regency brand gives guests everything they need in one place – fantastic hotels and resorts around our region and across the world, caring staff, excellent food and much much more,” said Eric Brun, Senior Vice President–Brands and Commercial Strategy, Hyatt International, Europe, Africa, Middle East and Southwest Asia quotes. The FAM program was truly a paraphernalia of luxury, sumptuous food, rejuvenation and the Mumbai experience. Apart from the serenity of Hyatt Regency within the hustle and bustle of Mumbai, #GetCarded – an in-hotel activation by the hotel as a part of ‘Make the most of being away’ campaign, was another highlight of our experience. This social media initiative by Hyatt Regency Delhi and Mumbai, intends to delight guests with goodies, which would help them indulge in their getaway routine. Under this initiative, guests can avail of enjoyable boxes of goodies by merely uploading an Instagram image of their chosen gift card, offered to them on arrival. These hampers fall into three distinguished categories, represented by a card each – Sweet Tooth (includes chocolates and pastries), Game Night (includes playing cards, popular card games) and Good Hair Day (includes mask treatment, serum, hair wax and gel). Once I was all checked into my room , I was given three cards to choose from and knowing my love for sweets, I had to pick the Sweet Tooth card and I was in for a real special treat soon. I received this absolutely delightful Fondue Set as part of my #GetCarded experience. After we were all checked and settled in, the first thing we did was head down to the hotel poolside to enjoy some fun in the sun. One of the things I consider the most peaceful is just putting my feet up and lounging on a sun bed by the poolside and that is exactly one of the first things I did as I got there. The pool looked oh so inviting and I also had the luxury of having it almost all to myself, so I had a nice long swim too. Since we didn’t want to miss out on some quality time in the sun, we decided to snack by the poolside on some delish fish and chips,a scrumptious club sandwich and some freshly squeezed orange juice. The Spa definitely ranks high up on my list of what I love to do on my Staycation. The best part is that you are in no rush to run anywhere after you are done with your treatment, so you can truly relax. We made sure we made the most of The Club Prana Spa at the hotel and experimented with different treatments on both days. On the first day we took the Swedish Deep Tissue massage and on the second day we took the Choorna Pinda Swedam. I highly recommend the Choorna Pinda Swedam treatment, that is performed with herbal poultice bolus (a sack made of herbs and grains.) the thorough hot fermentation with herbal powders. This treatment is excellent for the relief of aches, pains, sport injuries and muscular stiffness. We were left so relaxed and rejuvenated after two days of such wonderful spa treatments. I made sure I also got some R&R after my spa treatment in the Jacuzzi . After our relaxing swim, spa and Jacuzzi time we headed off for dinner at the Stax – the Italian restaurant at the Hyatt Regency Mumbai. The bouquet of red roses handed to me by the hotel staff at the dinner table, added such a special touch to my evening. The food at Stax was absolutely delectable, we started with some herb chicken tomato soup and stir fried vegetables and went on to our main course with some grilled salmon and lamb chops. When we arrived back in our room, another special surprise awaited us, our bubble bath was all ready for us decorated with rose petals. We were thoroughly reveling in all the pampering by the Hyatt Regency and truly ‘Making the Most of Being Away’. The next morning after getting my dose of caffeine, some peaceful ME time overlooking the city and checking up on my emails, we headed off for breakfast to the Glasshouse – the hotel’s all-day dining restaurant. I must say that the Glasshouse’s breakfast buffet spread is one of the best I have ever experienced, with an extensive selection of Indian, American and Continental specialities with rotating live stations of Belgian Waffle, Miso Soup, Appam Stew, Pyaz kachori, ragda, Tibetan Thukpa, English crumpets. We were so spoilt for choice and decided to try out almost all 3 selections including the Indian, American and Continental dishes. Breakfast is one of my most special meals of the day and this one surely didn’t disappoint. A special mention to the absolutely delicious Belgian waffles, a recommendation by the restaurant manager. The next evening we decided to take advantage of the pleasures of In-Room dining instead and ordered in from Stax. We started off with some red wine, that was sweetly gifted to us by the hotel staff on our arrival. We once again devoured the delectable food from Stax . For dessert we had the Tiramisu, that I must say is total perfection – this coming for a real dessert connoisseur. Me and my husband spent some real quality time together and had the most amazing time at the Hyatt Regency, Mumbai and truly made the ‘Most of Being Away’ from home. The whole experience left us so refreshed and in a more calmer state of mind to get back to our daily routine with ease. A special mention to the wonderful staff at the hotel that added a real special touch to our whole experience, from the sweetest & smallest gestures like the hand-written welcome card, the welcome bottle of wine, the bouquet of red roses at dinner to the rose petals laden bubble bath. We also loved the fun #GetCarded concept and you too must make sure you try it out on your next stay at the Hyatt Regency – Mumbai & Delhi. Ps: If you’re staying at the Hyatt Regency in select locations around the world, you too can participate! Get in touch with your hotel for more! When was the last time you had a few days off from your hectic schedule to just BE- footloose & fancy free , without a care in the world, without having the luxury of time for a full blown vacation?? If you’re also looking at breaking away from your daily routine, being pampered silly and spending some quality time either just by yourself or with your spouse/family, the FAM to Hyatt Regency is surely a perfect fit ! Make the most out of everyday, whether you’re traveling the country on business or just looking for the ultimate Staycation at the Hyatt Regency.